A GP has been struck off for faking clinical trials and claiming a patient was an ex-smoker with a 20-a-day habit when he had never smoked at all. The General Medical Council (GMC) tribunal also heard Jerome Kerrane faked records and pocketed cash from the tests. Mr Kerrane showed "persistent, sustained and deliberate dishonesty", the tribunal panel ruled. The GP from Blackpool did not attend the hearing and was not represented. The GMC's Medical Practitioner Tribunal Service found that Mr Kerrane enrolled 14 ineligible patients, from Layton Medical Centre, Blackpool, into clinical trials between 2007 and 2014 for drugs to treat chronic pulmonary obstructive disease. The tribunal findings, which have just been released, showed Mr Kerrane entered a non-smoking patient as an ex-smoker in his NHS medical records - a category covering people who either smoked 20 cigarettes a day for 10 years or 10 cigarettes a day for 20 years. Mr Kerrane, who qualified as a doctor in 1996, also directed that fees for the trials should be directed to his personal bank account, not Fylde Coast Clinical Research Ltd, which carried out private clinical trials on behalf of drugs companies. He was a senior GP at the practice where he had worked since 2005 and principal investigator at the research company which was based in the same building as the medical centre and used the same computer system. The GMC investigation also found that the GP emailed Novartis Pharmaceuticals Ltd falsely stating that practice nurses had issued salbutamol inhalers to patients. He then retrospectively altered their medical records to include these fake prescriptions. The tribunal, which ended earlier this month in Manchester, accepted there was no previous evidence of misconduct from the doctor who had not harmed his patients and was "clinically competent". 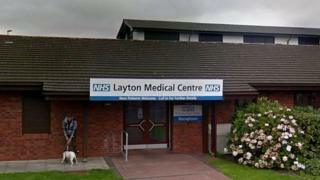 Nobody from Layton Medical Centre was available for comment.